Compared to other organizations from other industries, CPG businesses are typically more reliant on decision-making efficiency to remain competent. Since important decision-making mostly revolves around strategizing pricing, marketing campaigns, sales trade promotions, assortment optimization and inventory management, Revenue Growth Management (RGM) became a key aspect. The main objective of RGM or Net Revenue Management (NRM) or Strategic Net Revenue Management (SNRM) etc. is to profitably optimize key strategies around pricing, new product/market investments, marketing/sales campaigns, logistics etc. An effective RGM strategy ensures the maximization and acceleration of organizational revenue with a minimal spend. In fact, companies which executed a powerful RGM strategy have realized a sizable market share growth and tangible gains in business top and bottom lines. Based on the brand objectives, available market and consumers insights, competitive intelligence etc., RGM executives recommend the best-fit strategies for the relevant departments and officers. Needless to say, the accuracy of these recommended strategies has a huge impact in realizing the overall ROI and driving revenue. However, in most CPG companies, strategies are developed based on low-quality data (historical data, data from limited sources etc. ), as a knee-jerk reaction to competitor’s behavior or learnings from past experiences. In some companies, an analytics tool is already being used, but usually the insights obtained are extremely generic and non-actionable. And the ones which provide meaningful intelligence are generally too sophisticated and hard to incorporate in daily workflows. As a result, there are high chances for missed growth opportunities, ROI, revenue leakages etc. CPG companies generate humongous amount of big data every day – both from internal and external sources. Thanks to the rapid advent of digital media, a considerable amount of this data (social media interactions, search analytics etc.) is in unstructured format. With the growing digital population and increase of digital marketing budgets in the CPG industry, more and more brands have recognized the necessity of social listening and analyzing digital consumer behaviour. Some other notable examples of unstructured data also include data from weather, TRPs, etc. Traditional analytics tools won’t have the capability to process this type of data. AI technologies like machine learning algorithms, predictive and prescriptive analytics can harness enormous amount of both unstructured and structured data at a time and convert it into real-time insights. While collecting data from different sources improves data quality, you can obtain actionable intelligence only when a powerful analysis is run over this data. In a fast-moving and competitive business environment, RGM executives should spend less time understanding the analyzed data and more time getting actionable insights from the analysis. However most traditional analytics tools don’t support such advanced mechanism and users need to go through numerous reports and toil before arriving at a conclusion. On the other hand, AI-powered advanced analytics like predictive and prescriptive analytics implement a fact-based approach. By identifying trends, patterns and anomalies in the feeded data, these technologies deliver crisp and actionable recommendations and insights to users, thereby enabling a convenient and faster decision-making. Unlike traditional analytics which give information on what happened in the past, these analytics forecast the future and provide recommendations in crucial “what-if” scenarios. Developing fact-based long-term and short-term business plans becomes stress-free with a great reduction in mis-calculations. Become more confident while providing recommendations and developing strategies for marketing or sales or finance departments. Since these technologies automate the process of gaining insights from the data, the chances of human-error greatly reduces. Identify and carefully optimize spend on different market/product segments, new growth opportunities. Accurately forecast and design robust price-pack architecture, market-mix modelling, highly profitable marketing campaigns and trade promotions, and leak-proof logistic operations. Understand your as well as competitors’ trade promotion effectiveness and learn where, when and how to promote. AI-powered chatbots allow convenient and faster data accession from the existing Business Intelligence software or analytics tool. Once deployed into any of the popular organizational messaging platforms like Skype for Business, Skype, Telegram,Slack etc., these bots extract relevant insights from the tool/software and present it before the user via chat. Sophisticated usage and tiring navigation flow are two common reasons a majority of analytics tools have low adoption. Built using enterprise chatbot platforms, these virtual assistants eliminate the tedious task of continuous switching of dashboards/windows. Users can get required information in both text and multimedia formats by asking one question at a time. Generally powered with Natural Language Processing and Machine Learning, AI bots allow users to ask questions and converse in a natural language tone. This simplicity of obtaining analytics within the already actively used messaging platform motivates users to rely less on gut-feeling or partial intelligence and always use data while making decisions. Chatbots add the element of speed to decision-making and bring-in a culture of regular usage of data during decision-making. Here’s an example of our Sales Intelligent Assistant for CPG companies sending insights on information of MSL compliance,Market Share etc. to the relevant field sales executive. Building analytical capabilities from scratch is a huge change management process and requires massive efforts. It is essential to find AI solutions which can integrate seamlessly into the existing ERP systems. AI should be viewed as a dynamic add-on to the existing BI platforms that converts the already available data into rich and meaningful intelligence. In short, a good AI solution should not require too much change management process from existing systems and must enable decision-makers to use the current data to the fullest hassle-free. Also, most RGM teams are cross-functional. The teams usually have executives from sales, marketing, operations and finance. And there will be teams at multiple levels of the organization (corporate level, regional level etc.). The chosen AI solution should tailor and individualize insights to all the decision-makers in different departments and levels. This personalization of insights brings consistency in accuracy and speed throughout the organization and thereby delivers improved results. By deploying an AI chatbot, a Fortune 100 British-Dutch transnational consumer goods company increased MSL compliance in various countries at a range of 3%-15% and revenue by millions of dollars. 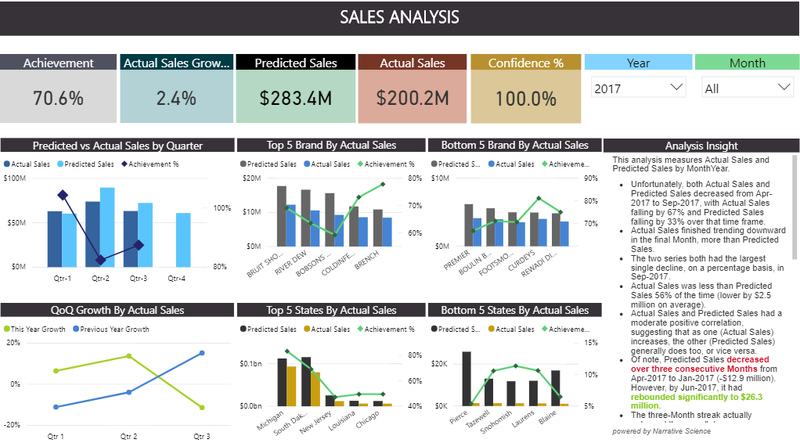 A Billion dollar CPG company’s field sales teams used AI bots to query sales and operations related metrics like Net Revenue, Stocks, Trading Contribution, etc., on the go. The bot implementation increased the sales productivity by 5% and boosted annual revenue. Some other key achievements include increase of market share by 2%, marketing ROI by 3%, primary sales by 2-3% and secondary sales by 10-12% etc. Visit this page to request the detailed case studies of each company and the specific AI technologies used in each scenario. 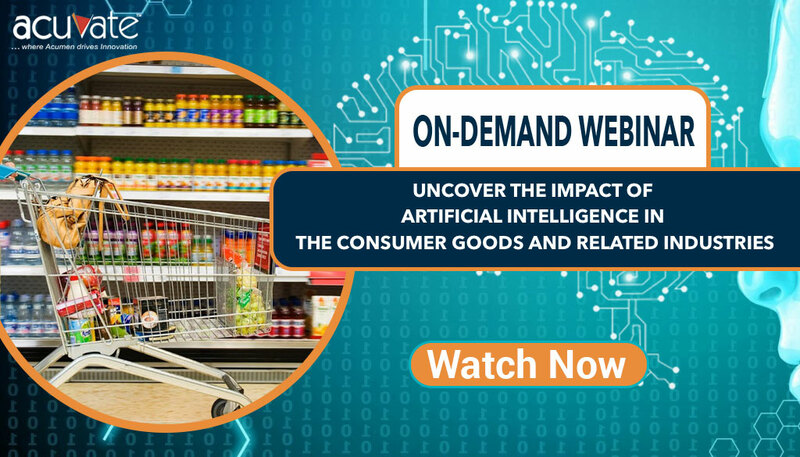 Know more about Acuvate’s customized Artificial Intelligence solutions for CPG companies.